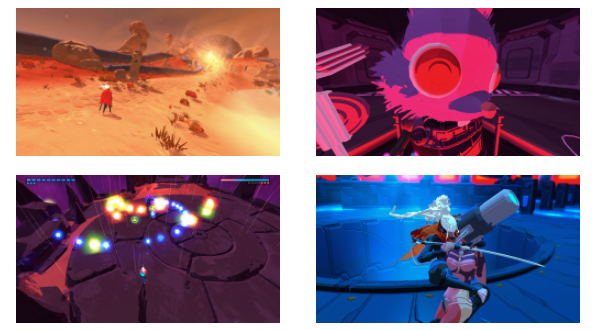 Since Furi’s release, we have wanted to share with fans and videogame lovers the amazing work done by the Furi art team over the two years of development. 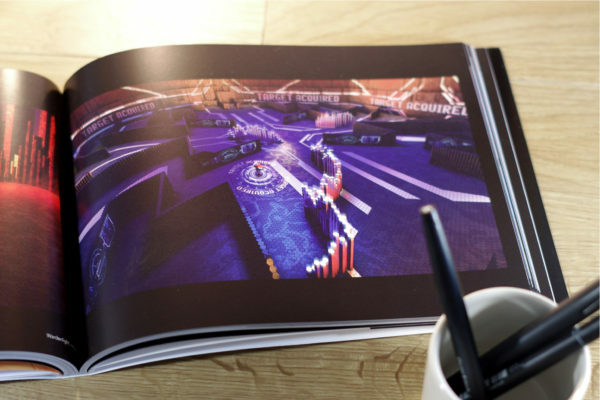 Today we are happy to announce we have gathered it all in a beautiful artbook. 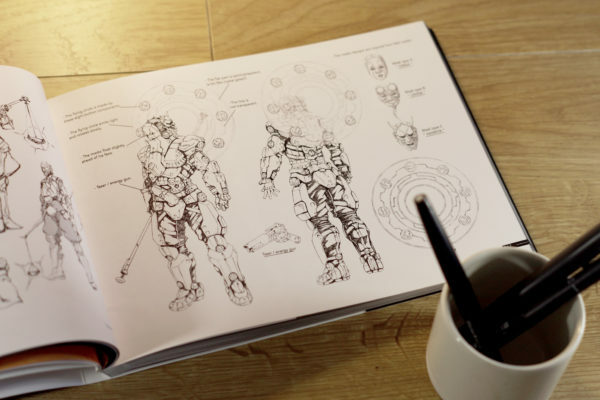 In Furi Complete Artworks you will find the ultra-detailed characters sketches by Takashi Okazaki – renowned mangaka and the game character artist – but also work by the whole of Furi Art team: the environments concept art, cutscenes storyboards or even research drawings for combat moves. Notes from the dev team help understand the creative process behind the guardians, their worlds and Rider, as well as the nurturing back and forth between game design and art. There is also a Bonus section that includes artworks for characters or scenes that didn’t make it into the game. Furi Complete Artworks comes as a softcover book of 144 pages, on art-quality paper, measuring 255 x 180 mm (10 x 7 inches) with dust jacket. It is priced at 30 € / 30$ and is available now. Our partner online store ships worldwide. 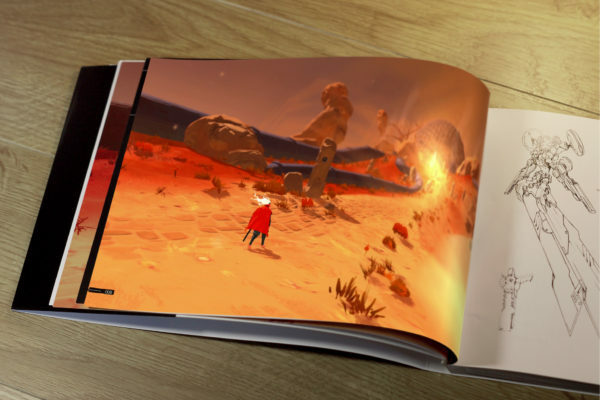 Indie game developer The Game Bakers are proud to announce the release of Furi Complete Artworks, a behind-the-scenes exploration of the visual development that went into the critically-acclaimed video game Furi. 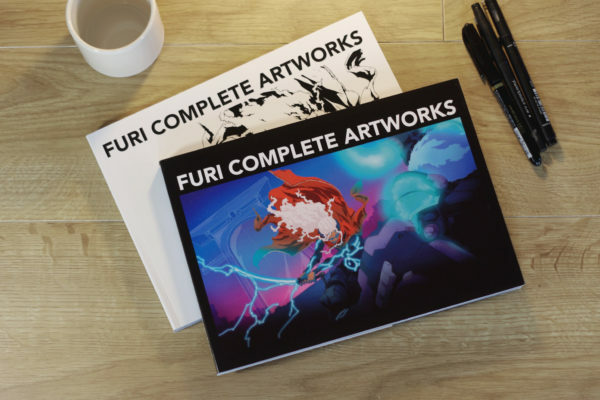 The book gathers all the preparatory artworks from the artists who brought Furi to life over two years of development. 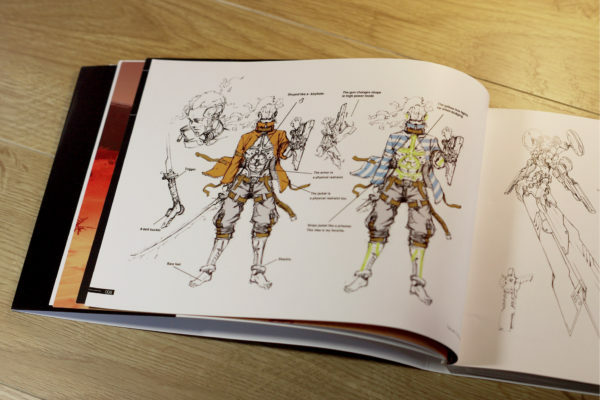 Readers will discover ultra-detailed characters sketches by Takashi Okazaki – renowned mangaka and the game character artist – but also work by the whole of Furi Art team: the environments concept art, cutscenes storyboards or even research drawings for combat moves. The Bonus section includes artworks for characters or scenes that didn’t make it into the game. The partner online store ships worldwide. Fight your way free in our frenzied all-boss fighter, and discover what’s waiting behind the last gate. Furi is an ultra-responsive combat game with a unique mix of fast-paced sword fighting and dual-stick shooting. Each of the formidable guardians—designed by Afro Samurai creator Takashi Okazaki—has a unique combat style that requires focus and skill to defeat. The high-energy action gets a boost from an award-winning soundtrack composed by up-and-coming electro and synthwave musicians. Deemed ‘supremely stylish,’ ‘genre-bending,’ and ‘intensely engaging’ by the gaming press and praised for its unique mix of sword fighting and dual-stick shooting, Furi has garnered an overwhelming 93% positive reviews on Steam. That’s it! Furi is available on Switch and that makes us very happy and proud. The players’ response so far is extremely positive and the press seems to validate the quality of the port. Some players asked if there was any differences with the other versions (PS4, XboxOne, PC). There are some minor differences indeed, that I will list below. I won’t talk about the small technical optimisations we did. For instance, in the other versions, the hair and coat of the main character are rendered with physics, and in the Switch version, we made all the movements within the animations. It looks almost better, and saves a lot of frames. The list below focuses on differences that affect gameplay. The bosses HP has been reduced by 20% in long range combat only, and in Furi difficulty mode only. After a year of watching players and getting feedback, we felt that the Switch version could benefit from a minor difficulty tweak. Because we think that difficulty is key to make a boss memorable, we didn’t take that change lightly. We asked Switch owners who never played Furi to come to the studio and playtest this new balancing. The didn’t feel it was to easy – oh boy no they didn’t. They difficulty tweak doesn’t remove what’s difficult in the game (learning the patterns, the time required to parry or dodge), but makes retrying a little bit less tedious. I guess for the speedrunners competing on the global ladder, this means the Switch version is a different category. Some shoot patterns have been modified to improve the performances on Switch. This can mean: reducing the amount of bullets but increasing their size, reducing their time on screen, or designing a new pattern. It only affects a handful of patterns in the game, but was necessary to keep a smooth framerate. (Note: in this video, the audio on Switch was badly compressed. There is no audio difference between the PS4 and the Switch, we double checked). 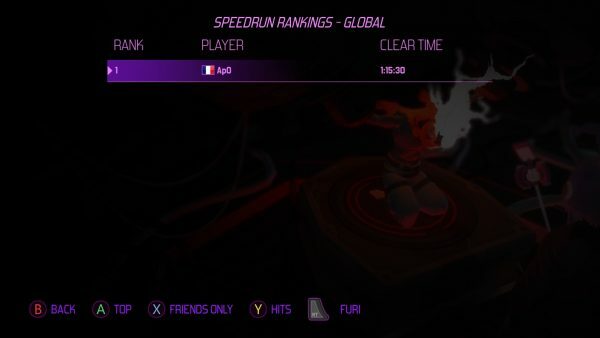 There are no global leaderboards in the Switch version, but on the other hand you can speedrun the game in Furier difficulty, which includes The Flame and Bernard (the DLC « One More Fight » bosses). The Speedrun in Furier is not available on other consoles. The PS4 & PC DLC « One More Fight » unlocks after getting any ending in Furi mode (also true for the secret ending in The Song level). 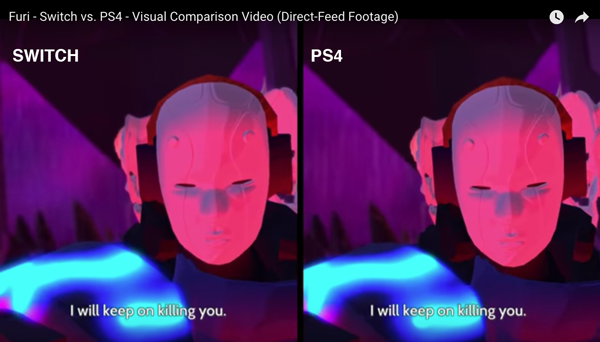 That’s all the differences there are with the PS4 and PC version. Furi confirmed for release on Nintendo Switch Thursday January 11th, 2018. Furi is confirmed for release on Nintendo Switch next Thursday January 11th, 2018. Our content complete, challenging dash-and-slash adventure will be available via the Nintendo eShop, priced at €19.99 /$19.99 /£17.99 . Watch the game’s latest trailer here. Furi’s release on Nintendo’s console is entirely feature complete. The Switch edition includes the boss roster-expanding “One More Fight” DLC, the option to speedrun its ultra-challenging Furier difficulty mode (never before available on console), and all improvements and updates previously added to the game. We are available for interview about the Switch edition of Furi. Yeah, Furi is coming to Switch soon, early 2018. We have put a lot of effort in it, but we are very happy with the result!! The game looks and plays great! The Switch version will include all the content that has been released for Furi across all platforms so far, as well as all even more optimization, bug fixes and other tweaks we have done over the last months. It’s a great package for Switch players. Apart from the pleasure of having a whole bunch of new players discovering the game, we are also particularly happy as there was not one day when we didn’t receive a mail or a tweet from a fan asking for Furi on Switch. We heard them in particular talking about the pain of having to interrupt a fight because life was calling. Well now with the Switch, you can continue your boss fight on the go! At The Game Bakers, we love the Switch and we play on it a lot, but we are particularly proud to bring a game like Furi on it. There are not many fast-paced arcade & action games on Switch so far! The game will be priced $20/20€. We will confirm shortly the release date. November 30, 2017 – Indie developers The Game Bakers brings their ultra-fast-paced, combat-action hit Furi to Nintendo Switch. Furi is all about the tension of one-on-one fights against imposing opponents over a mysterious quest for freedom. Praised for its unique mix of sword fighting and twin-stick shooting, Furi has been called “supremely stylish and intensely engaging” (Games Radar) and “tight and empowering” (Games™), and has garnered 92% in positive user reviews on Steam. With its stylish aesthetic and unique character design – by Takashi Okazaki, Afro Samurai’s creator – and its killer soundtrack featuring popular electro musicians Carpenter Brut, Danger and more, the game is a love letter to Japanese action games such as No More Heroes, Metal Gear Solid and Godhand. This feature-complete Nintendo Switch edition will be available early 2018, including all the content and improvements released so far for Furi. Tous les ans à cette période, je reçois des dizaines de candidatures d’élèves de 3ème qui veulent faire leur stage chez Game Bakers. Depuis quelques années j’ai aussi des demandes d’entretiens par des étudiants en IUT d’informatique, qui désirent poser des questions à un professionnel afin de dresser le portrait d’un métier lié à l’informatique. Evidemment, je ne peux pas recevoir tous les élèves de 3ème, ni faire dix entretiens d’une heure auprès des étudiants. Mais j’aimerais proposer quelque chose cette année : un questions-réponses en live, sur Twitch, pendant lequel je répondrai aux questions des spectateurs connectés sur le chat ou à des questions que l’on m’aura préalablement envoyées par email, sur Twitter ou sur les commentaires de ce post. Ce stream s’adresse à tous ceux qui sont intéressés par l’industrie du jeu vidéo, les métiers du jeu vidéo, les études pour intégrer cette industrie, les compétences requises pour trouver un emploi et s’y plaire. Une attention particulière sera portée aux questions des plus jeunes et des filles – à qui l’on veut parfois faire croire que l’informatique et les jeux vidéo sont des trucs de mecs. Envoyez vos questions en laissant un commentaire ici même. Et le référentiel métiers du jeu vidéo. I’m doing a Q&A about the game industry, the jobs, the schools, on twitch on saturday 25th. The goal is to answer questions from students and especially young ones (14/15 y.o.). It’s going to be in french only, but if many non-french speakers are interested I could do that again in english. Nous recherchons un.e stagiaire artiste 3D, dont la mission sera de modéliser, texturer et intégrer des props et environnements de notre prochain jeu console et PC sous Unity. Modélisation 3D et texturing (plutôt pour du traitement non réaliste). Maitrise du pipeline graphique de Unity. Connaissance des contraintes et techniques d’optimisation. VFX et Shader sont toujours un plus ! Bases en animation sont aussi un plus. Il s’agit d’une mission qui peut se faire à distance en télétravail ou dans nos locaux à Montpellier. Les deux tiers de l’équipe sont déjà « à distance », nous sommes organisés pour travailler en équipe de cette façon. Dates : Septembre 2017 à Février 2018 (4 à 6 mois, préférence 6 mois). Merci de vos candidatures passionnées ! 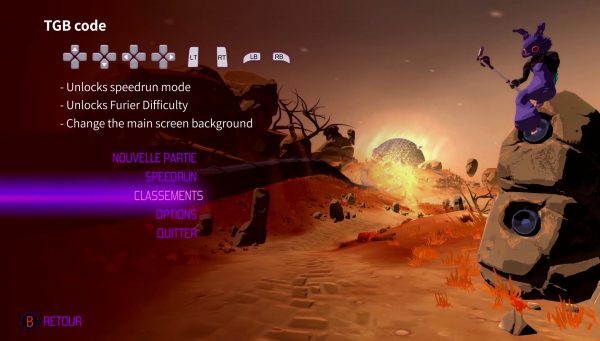 That’s it, the race for the best score at Speedrunning Furi in Furier difficulty is open! For the Speedrunners on Steam looking for the extra challenge, we have released just now the Beta version of Furi with the Speedrun mode in Furier difficulty. The One More Fight DLC bosses The Flame and Bernard are included for the complete challenge. In Steam, do “Properties” on Furi in your library. The Beta tab will appear, enter the password: FurierSpeedrun. 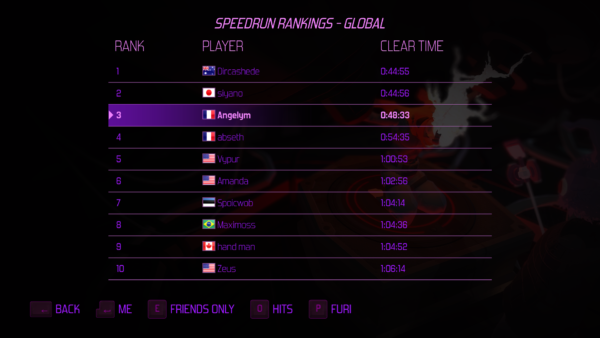 Then selecting the Beta FurierSpeedrun in the list will download the patch. If ever you would like to return to the original Furi game, you can chose “none” in the same property list. Our QA expert Jérémie has opened the race. Good luck to all! Speedrun Furi in the hardest difficulty, unlock content with the TGB code, new avatars and big discounts on all stores. For our Speedrunners on Steam looking for an extra challenge, we are releasing next week a Beta version of Furi with the Speedrun mode in Furier difficulty! The One More Fight DLC bosses The Flame and Bernard are included in the mode for the complete challenge. Follow us on @thegamebakers or Facebook.com/thegamebakers for the release next week. We will be releasing soon some new free Avatars for PlayStation players. And the game is reaching record discounts on most stores for the season sales: 50% off for the Steam Summer Sales, 50% off for the PlayStation US Mid Year sale, etc. Get your copy now if you haven’t yet!